2400 Degrees Fahrenheit is a working studio and a gallery. 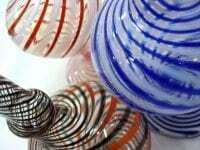 Michael and Misato Mortara are nationally recognized glass artists whose works are featured in fine art galleries across the United States. Watch them create lovely pieces before your eyes. The gallery displays a wide range of work including pieces not available elsewhere. The studio and gallery are located along HWY 11 on Old Volcano Road between mile markers 23 and 24.